1. How do you rate this entire Series 5? 3. After reading this review and seeing actual images, do you like Series 5 now? 4. 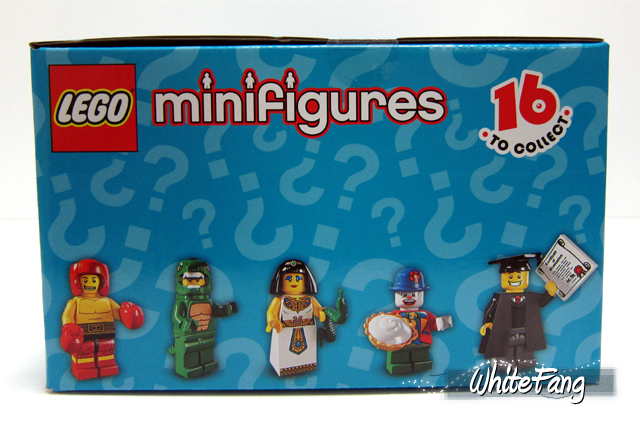 Right now, what is the best released LEGO Collectable Minifigures Series so far? I am really feeling very excited now to be back again to bring all of you another brand new continuation of the successful LEGO Collectable Minifigures Series! 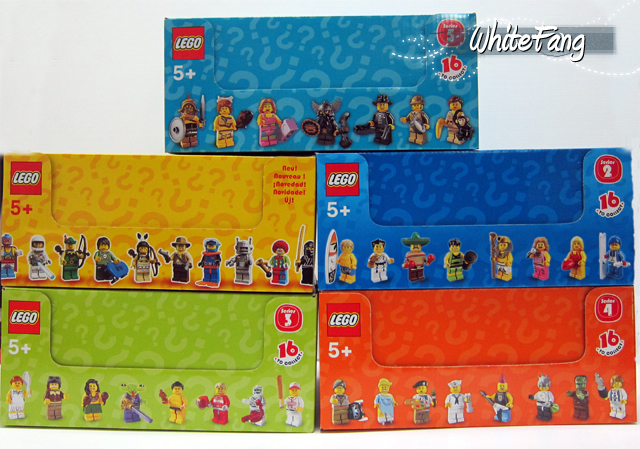 This time, the LEGO Collectable Minifigures Series 5 offers more new and exciting elements that will leave a "wow" smiling expression at the end of this review. Firstly, I will like to give my thanks to TLG (The LEGO Group) for being appreciative to provide me with such an opportunity to do an exclusive insight review for this new series and to the Eurobricks Staff and our Ambassadors for being so supportive to me to helm the Collectable Minifigures Series campaign for Eurobricks. Furthermore, with the community spirit and the love of our hobby, this is what keeps me motivated and continued to work hard to make this a reality. Lastly, I will also like to thanks to a special someone, "Belun" for being there for me. Thank you everyone. It's time to walk down memory lane. The year 2010, had all of us going crazy over Series 1 and Series 2. This year 2011, TLG gave us more than 2 series and decided to launch Series 3, Series 4 and the current Series 5 which will be released worldwide from the period of August to September. I supposed after the end of this review, perhaps you can head back to the Series 5 poll statistics and amend your voting choice once more! Did I mention that the new sky blue packaging theme is my favourite colour? Compared to the previous colour schemes, the new sky blue looks pretty soothing to my eyes. Below are some of the image links that portray the different angles of the box. What could possibly contain within these mysterious packets? 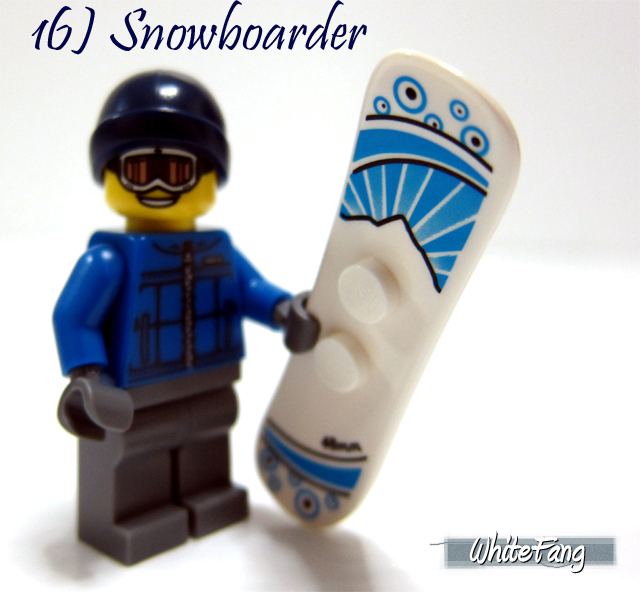 Our new objective is to complete a set of 16 unique minifigures for Series 5! At the start where we first seen some first-hand images of Series 5, most of us are not very impressed including myself too. 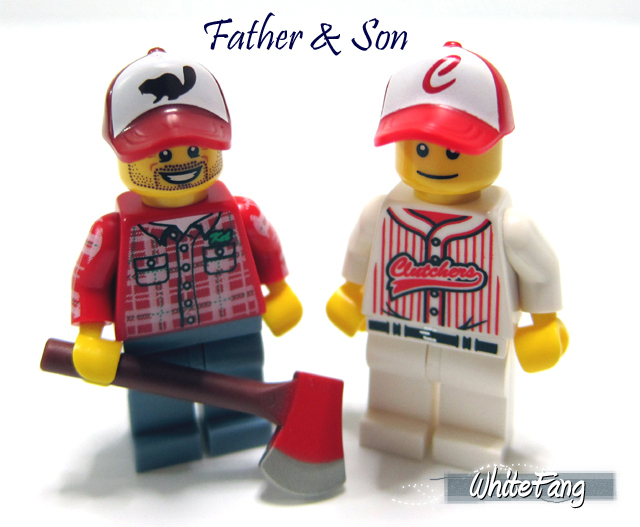 We will thought the novelty of collecting these minifigures will eventually died off, but we are wrong. It was proven correct as more detailed Series 5 images shed to light and we are now facing another fanatic collectable mayhem, where more focused new relevant minifigure awaiting to be integrated into your existing collection. Let me show you how it can be done! By the way, all of the names which I have used to represent the LEGO Collectable Minifigures Series 5 are not official TLG representation but for me to use to associate with what we are familiar with. Thanks. At this rate it is going, I don't think I will have enough space to take all of these packets together. These packaging colours certainly complement with one another and it made me smiled to see how far this new innovative theme had gone. Gone were the days of scanning barcodes. 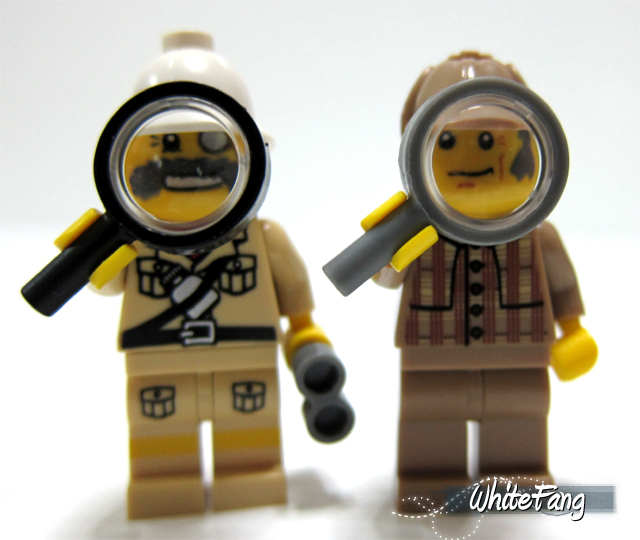 It felt as if it was a long time ago, since we last messed around with barcode scanners to search for these minifigures. Instead, we are now accustomed to the primitive method of touch and feel and for myself, it had brought me a huge success to acquire the ones I am looking for. There are dotted codes at the back of the packet right at the bottom but I had never used this method before. Unfortunately, I can't help you guys with the dotted codes at the bottom as I don't have much prior experience in identifying it. This is the back image of all of the past and current series packets. This is a nice surprise for all hardworking graduates who worked very hard to earn their degree, sp they would all graduate together and attend the convocation. This is a lovely surprise and I just can't believe the designers had actually done it nicely. Not sure what faculty he is studying, but I could just assume he is a law graduate. A wonderful addition to our City civilian population! Perhaps, it's time to put up a graduation night for all of them? 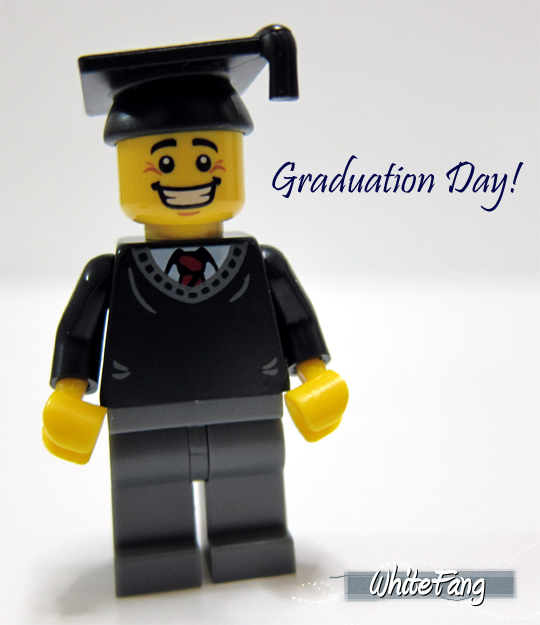 There are a couple of new elements like the graduation cap and gown. 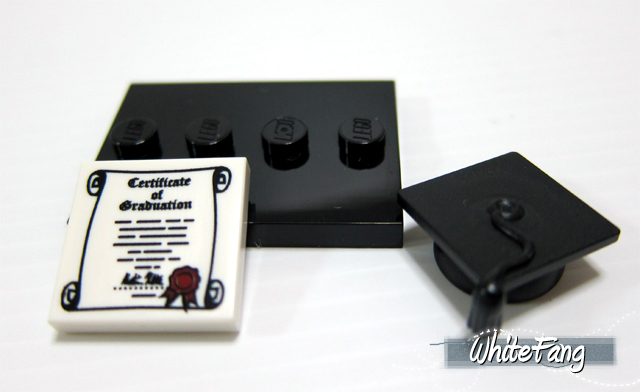 I am really impressed with the 2x2 printed flat tile with the wordings, "Certificate of Graduation". As for the gown itself, you will need to iron the edges, so they will not have to look like this after they have donned it. I remember I used safety pins to attach my gown together. Even the smile on their faces specially elated! Ever watched the movie acted by Russell Crowe, "Gladiator"? 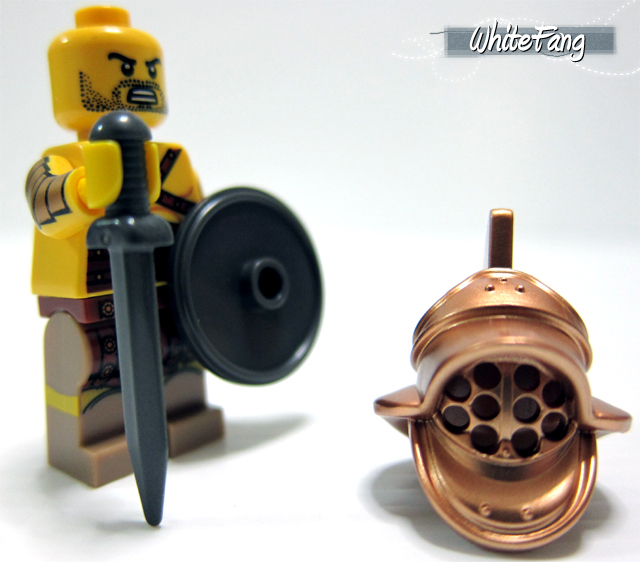 This first of a kind LEGO minifigure, which puts the Gladiator together is a new class of its own, just like the Spartan. The Gladiator is an armed combatant who entertains his audience through physical combat which may sometimes resulted in a certain death. 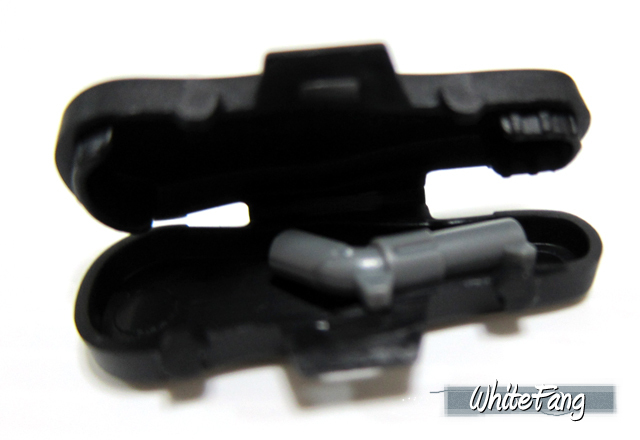 For myself, this is one of my absolutely favourite minifigure as the given parts are extremely extraordinary and useful. The gladiator's helmet and sword are pure beauty. I do not know how to describe but it gave me an impression that the helmet was made up of bronze. It was sturdy and hard and it left me a very strong impression. You got to feel it with your own hands in order to appreciate more of what you have seen. On the left side (facing front), he has a printed armour padding at the side of his elbow. I enjoyed very bit of quality details given to this special minifigure. I am also certain this will be as popular as the Spartan and Elves of the past series. Attention! 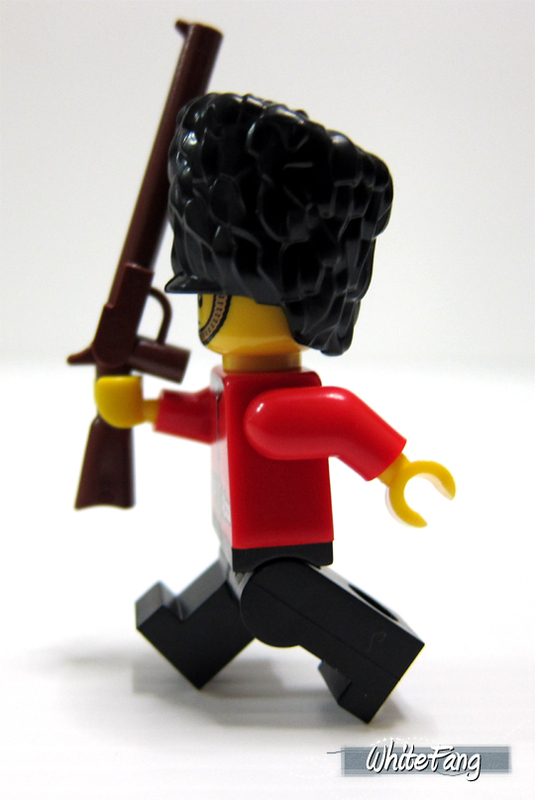 The Grenadier Guards are in LEGO town. Honestly, I can never believe that such precise accurate realistic traditional military regiement of our real life is being created in front of our very eyes. This is truly royal and classic iconic figure for the Great Britain. No doubt about it, for most army builders who want to build up a platoon. No need to fear, I am sure the distribution will surprise you. The tall bearskin fur cap is truly iconic and that piece of amazing new element helps to put this into proper perspective. Even though the rifle may look awkward from a certain angle but I am sure with some customisation efforts, it will looks nice and good. Another fisherman? This is different. Our Arctic friend, who is an Eskimo lives in his igloo and fish for his salmon beneath the thin frozen ice cap. His attire is very much suitable for the winter expedition with all of his furry gear all over him to provide warmth. 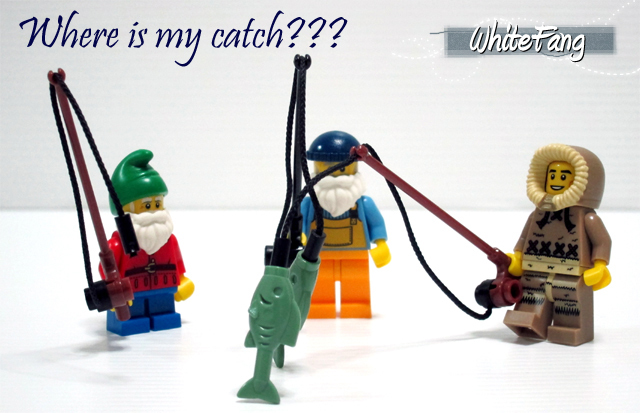 It comes with standard elements like his usual fishing rod and his catch. Not sure why his fish is the same as our Series 3 Fisherman's breed, but it's still nice to see it in sand-green though as the previous release in Series 3 was very limited. I absolutely adore this stunning cavewoman. She is pretty gorgeous and well dressed for someone coming from a prehistoric era. Every bit of print is just so detailed. What's more important, is that the Series 1 Caveman finally got a companion after a long wait. It comes with a brand new hairpiece that felt like soft rubbery piece. You could wear the accessory of the bone on top of her hair and bring the new dark brown club around. There is printing behind her back which helps to add the details. This is an image of herself without the bone on her hair. Looks nice to me on it's own. This gigantic Godzilla costume is adorable. Oh well, he is not that gigantic but more of a minifigure scale. 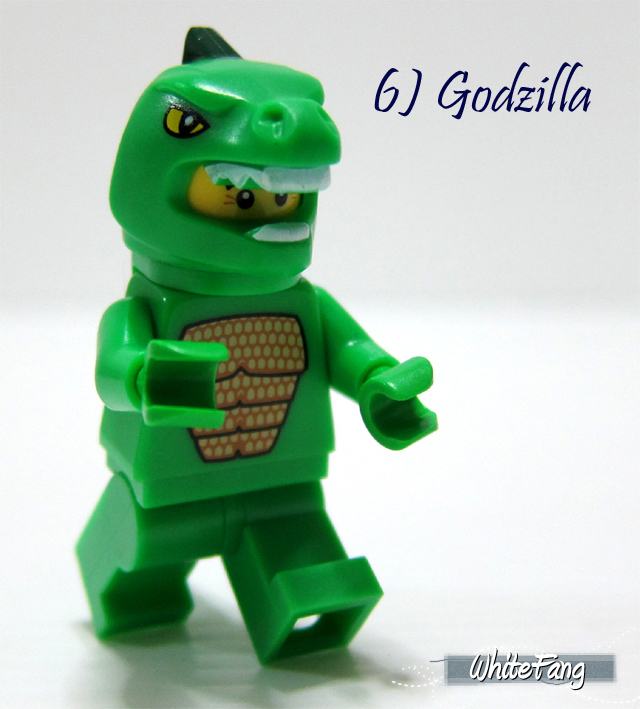 He will works well in fun fairs, mascots, or even a green dinosaur to entertain children. All of us knew he was wearing a costume since we can see his expression. Definitely an entertaining piece of minifigure. The parts assortment are mainly of many new unique elements especially for its costume like the long tail and dinosaur head piece. He does not appears to be sweating but more like enjoying himself in this outfit. This is the side and back view of the person wearing the Godzilla costume. She does looks like a sweet and caring Zoo Keeper, taking good care of the monkey. 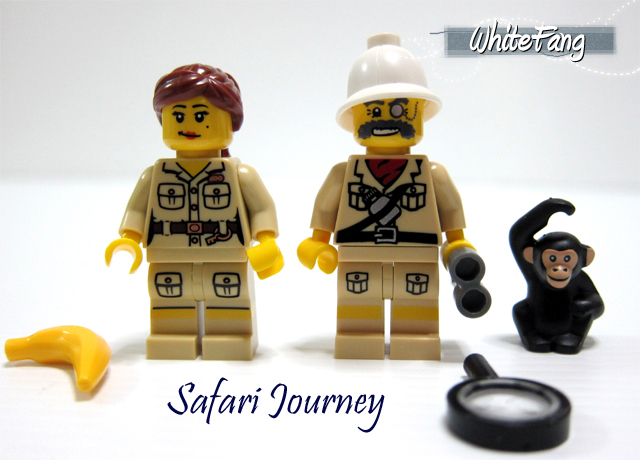 Her attire can also be classified under safari staff or someone going out for jungle expedition, like the Series 2 Explorer. If you notice the girl's facial expression carefully, you might also note her beauty spot too. I don't recall seeing any from the previous series. 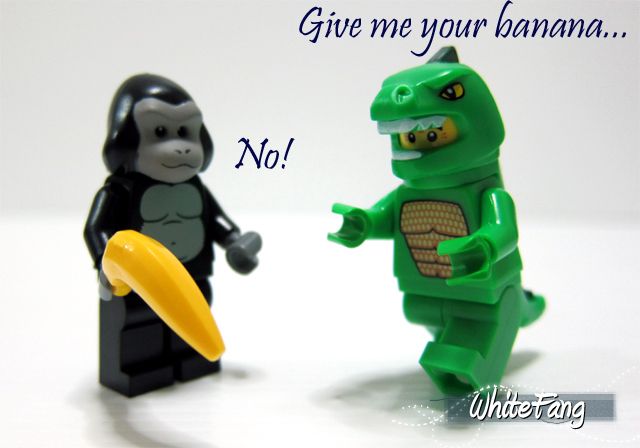 The main highlight of this minifigure is definitely the monkey. Even though the monkey is not as posable as the existing ones, but the prints are amazingly detailed and beautiful. Actually, I mistook it as a standing ornament but since there is a banana on her hand, I should assume that it is a "live" monkey. Most of you will just undermine the Woodcutter and I am not going to do so. 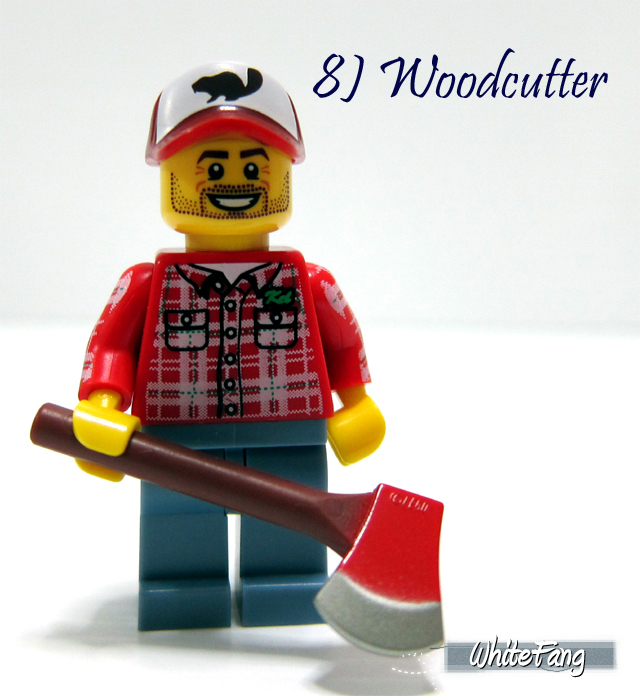 He is not just like your regular woodcutter. Instead, his prints on the torso is the most detailed among the rest. Armed with his trusty real axe instead of those puny little ones from the fire department. The fire department ought to borrow it from him instead. 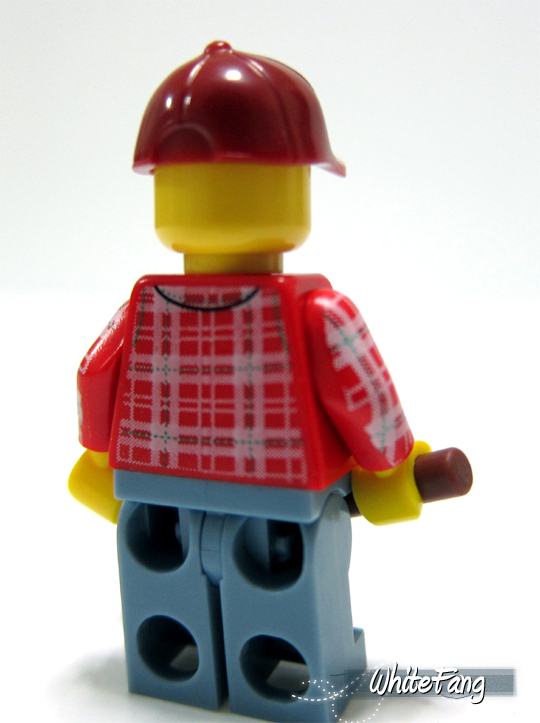 The axe and the cap are some of the new civilian elements introduced for this woodcutter. Whereas, the actual beauty is the torso of his front, back and side detailed printings. Don't you agree it is amazing? I am not sure how I piece this two together, but I just had that strong feeling to do so. It looks meaningful to me. Who needs another clown when we had one in Series 1? Oh well, you will be very mistaken if you choose to ignore this. 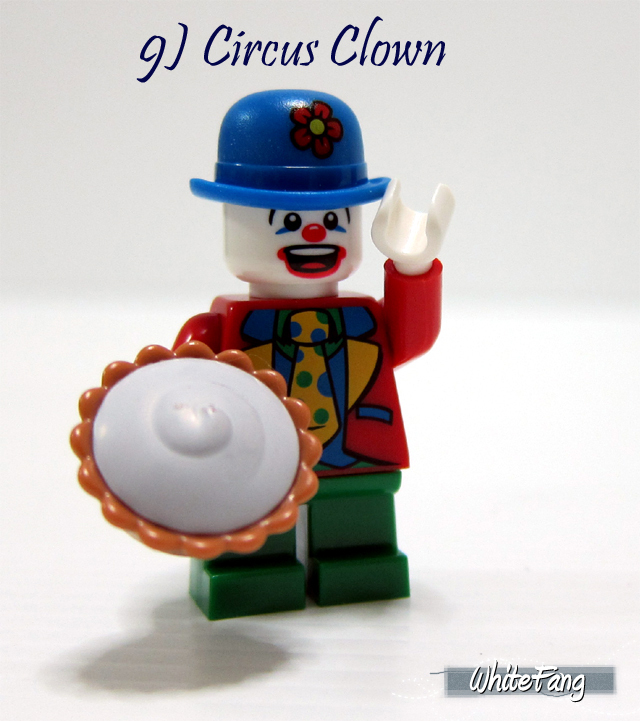 In fact, this new Circus Clown complements very well with the other one. It needs two hands to clap and it is the same for this funny performance too, to have 2 hilarious clowns on the stage to make the audience laugh. The parts assortment are pretty good too, especially the pie which we can use for food items and the clown hat for some cute costumes make up. 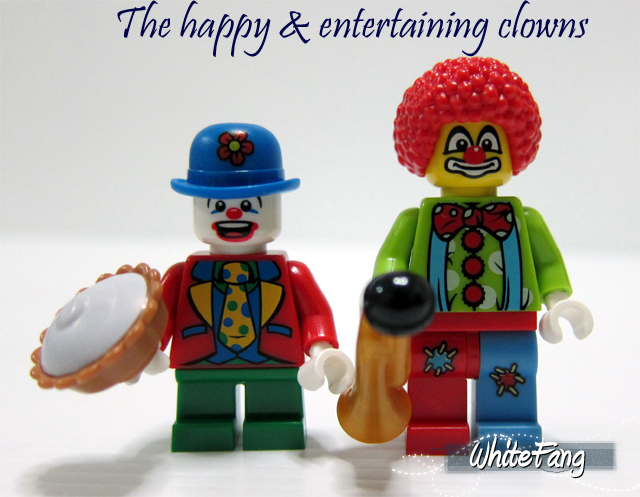 This time, we got a perfect white clown for his expression. On the music and let this Aerobics Instructor brings fun to your physical workout with her nice radio set. Sometimes, I do think she might be actually a dance instructor instead. Even though I may not be highly attracted to this minifigure, but it helps to bring in more variety to our boring City population. So far, for that, I welcome this! The parts assortment are quite standard and most of it comes in pink. The only interested item for myself, could be the pink radio set, other than that. I am not too interested in the rest. Sherlock Holmes is back to solve crimes? Oh well, he is not the real Sherlock Holmes, but a detective who looks like one. I like his vintage looking brown coat and his cape. This is quite a decent looking minfigure. 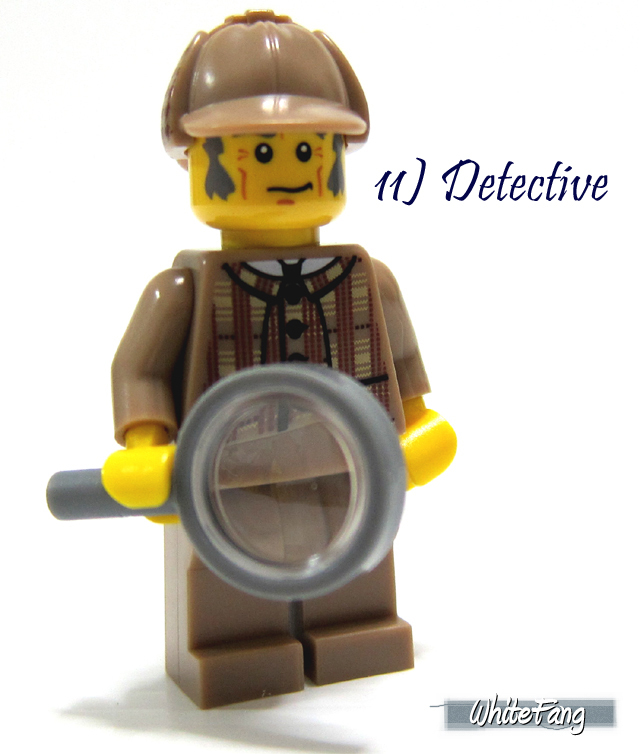 The parts to identify a witty detective must includes a magnifying glass. The cap is pretty cool as it contains print on its side. Personally, there is some intellect charm in this one. Can you see our faces? 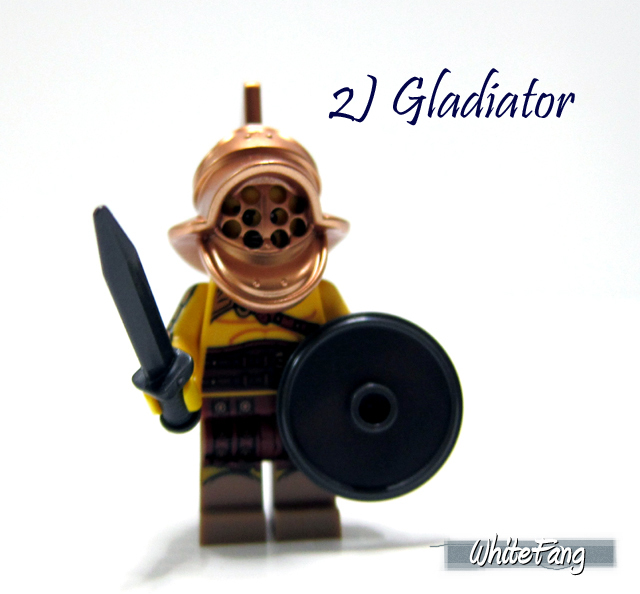 Apart from the mentioned Gladiator, this will be my ultimate favourite minifigure in this entire series! Yes, we had Dwarves in the year 2008, but this one is not a repetitive same old design! It's actually a representation of a brand new Dwarves clan that appears to be dark, sinister and evil. Can you feel its fierce and unfriendly aura? I just got to have this and this will definitely pose a problem for me to amass as there are many army builders out there. It comes with standard dwarf warrior outfit such as the helmet, double axe, beard and shield. All of it are new colour elements and designs. I really appreciate this minifigure very much and I can't wait to lay my hands on more of these. Even the shield appears to be nasty looking. This image shows the nice torso of the dwarf clearly without its beard on. 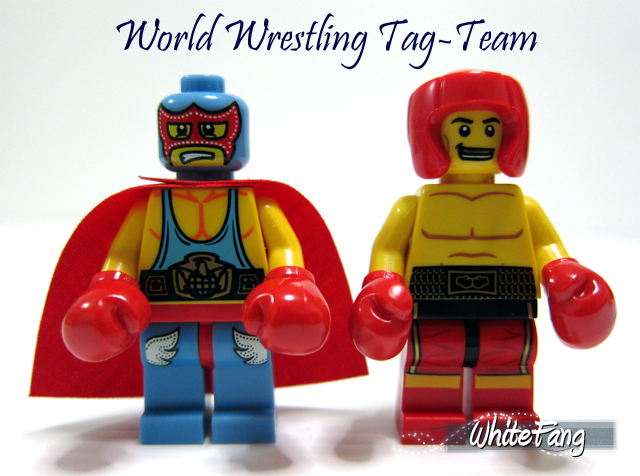 Our Series 1 Wrestler, finally have a deserving competitor to spar with. This boxer is giving no quarters to the Wrestler, even though he has no boxing gloves. 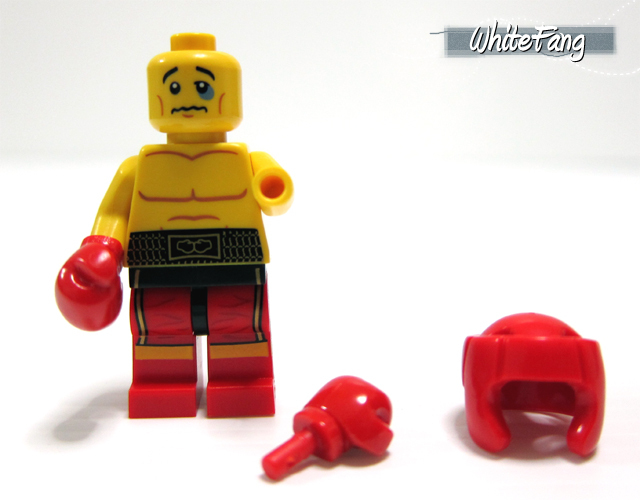 This is a very unique minifigure as it comes with boxer gloves instead of the usual typical minifigure hands. Just note his teeth and torso carefully, and you will notice he is a gold champion. 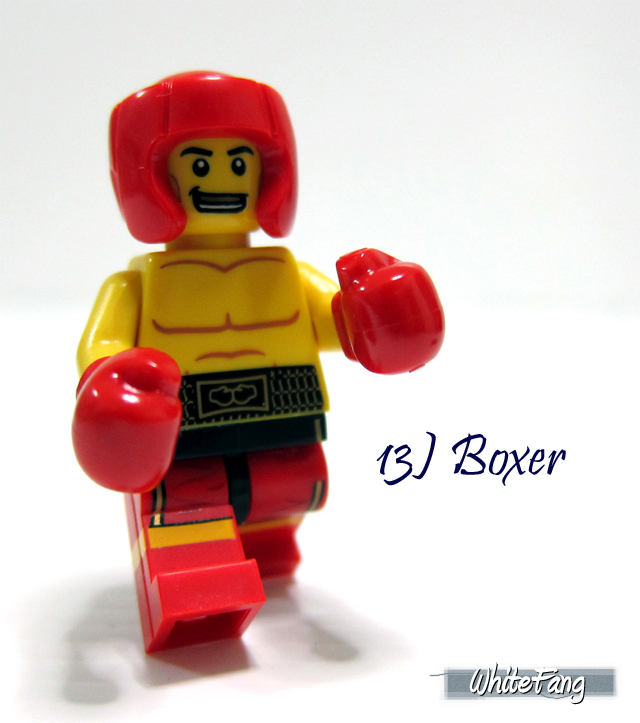 This image shows the best parts of the boxer as it entails dual expression plus the removal of the boxing gloves which will allow to re-attach to other minifigures. 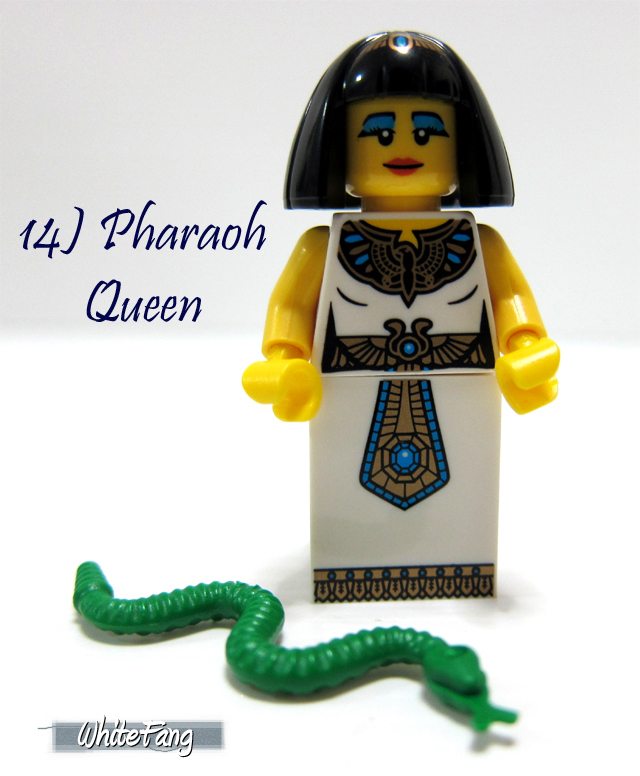 If you are a huge fan of Egyptian Adventures, then this Cleopatra look alike will make a fine ruler. Bits of those Egyptian hieroglyph can be found on her torso and hairpiece. 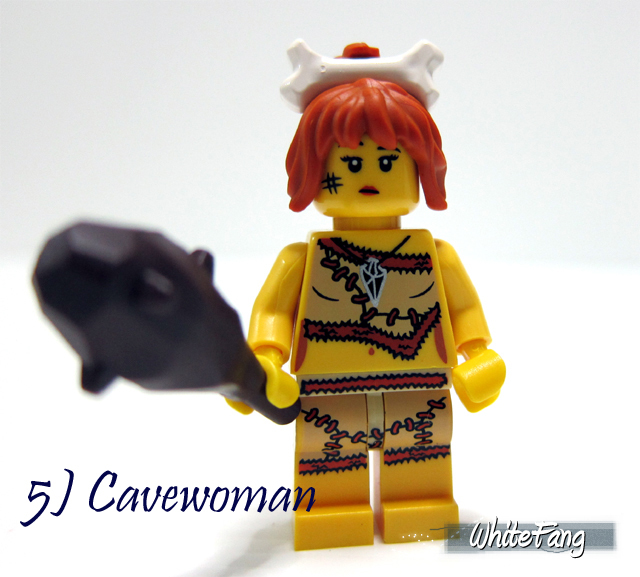 As long the designers keep up the good job of coming up with excellent female minifigures like this, it will continue to make us, AFOLs to go crazier over such female minifigures. There is nothing special, other than the minifigure itself. 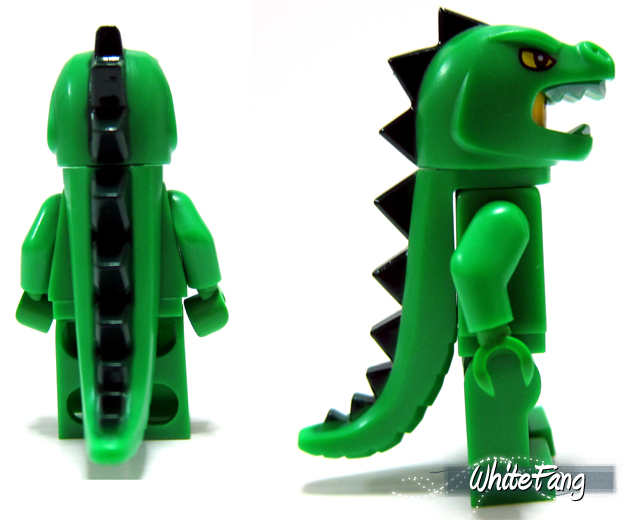 The green snake is commonly available in past sets. It is certainly an excellent addition to this settings. At first glance, it reminds me of our Eurobricks Mafia Games that we had, and at the same time it also chanced upon like those goons chasing after poor Indiana Jones. 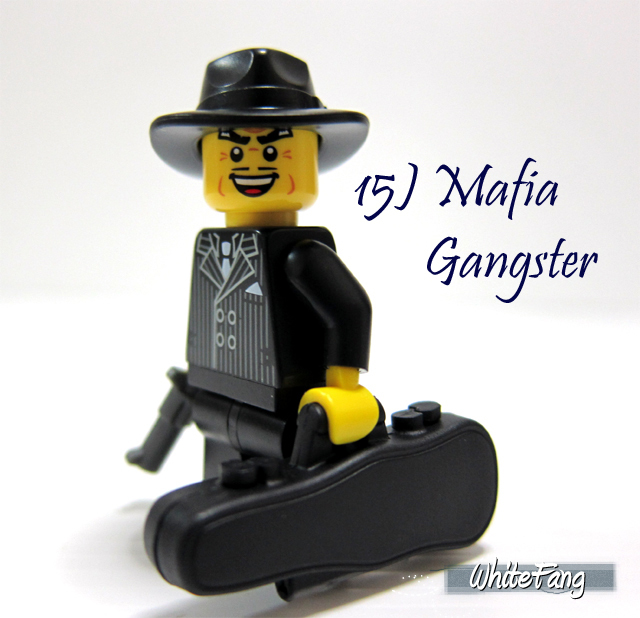 This Mafia Gangster is not to be messed with as he has a violin case with him. Don't expect him to play classical with this. 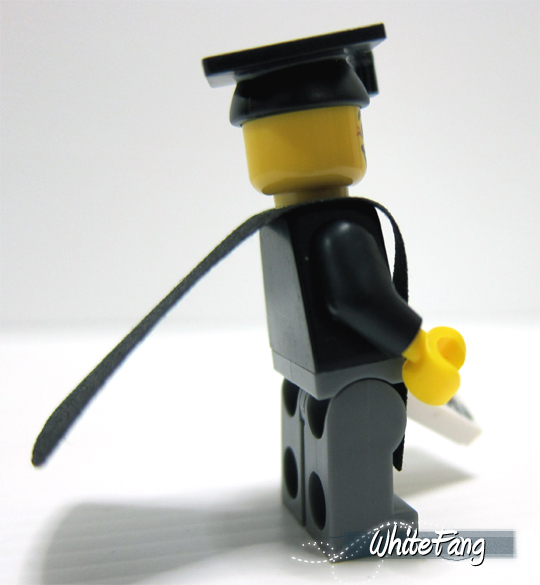 If you want to build up a mob, then this minifigure is the one for you. The best part about this is the violin case but it does not comes with a Tommy gun and the actual LEGO Tommy gun can't fit in there and you could only placed a revolver gun like this in here. I like that black suit though. It kinds of remind me of those Italian Mobsters. I am going to hear the usual same ranting of having another snowboarder. I think it complements very well with the female Series 3 snowboarder. Furthermore, it adds more variety on the snow mountain action. The parts assortment is quite average but the fact that the snowboard is a different printed design enhance the value of this whole outfit. The blue winter outfit including the beanie makes a fine combination. 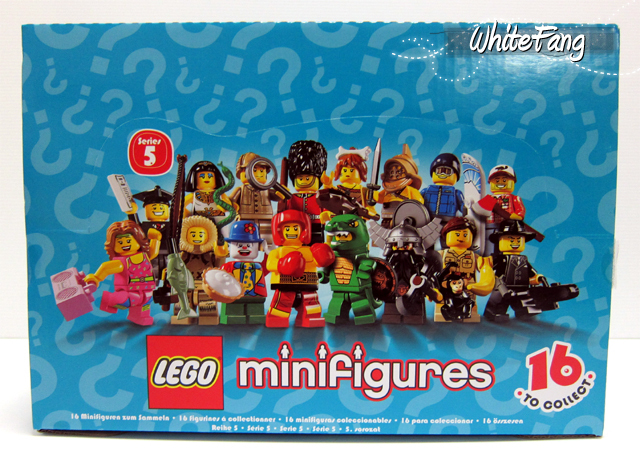 So, what do everyone feels about the current LEGO Collectable Minifigures Series 5? Did everyone feel disappointing or did you simply forget the disappointment and awaits to embrace the new series. 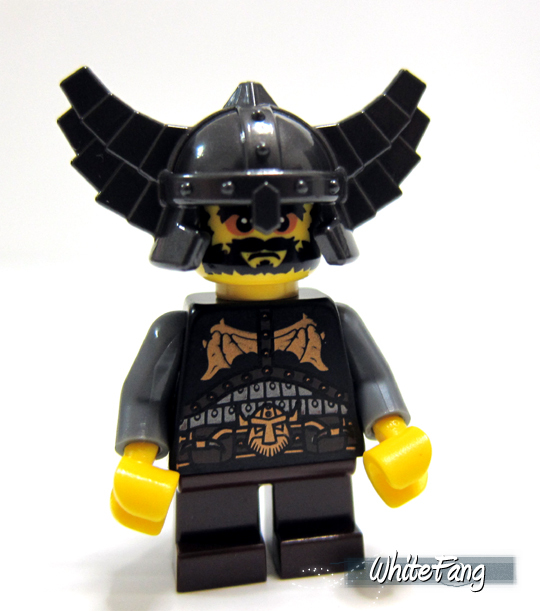 In my humble opinion, I think TLG have done an excellent job to keep most fans of LEGO including AFOLs to be very occupied to collect these collectable minifigures all over again and again for the past 1 year plus. Some of you may have grown weary of collecting but some people like myself continue to conquer and take on these collecting into another level. 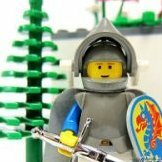 I, for one will not give up any of these 80 unique LEGO Collectable Minifigures. 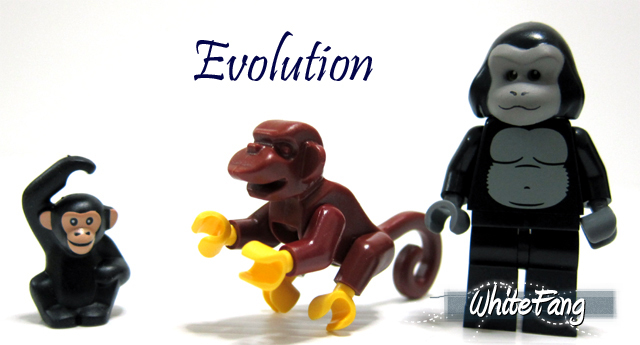 It has come a long way to see Series 5 evolving into present context and completing the whole theme into the legendary 80 Collectable Minifigures. 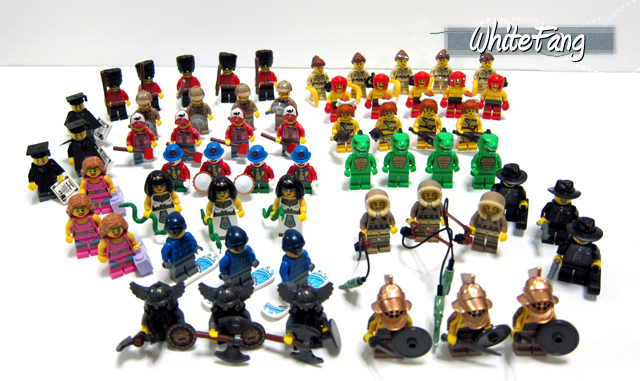 In any LEGO past or present themes, you can never see more than 80 unique LEGO minifigures in a single theme and this has proven wrongly. In all of mine past reviews, I have attempted to integrate all of the past series together to associate them with one another, so we could learnt to appreciate why these minifigures are produced in the first place. It might not be clear when the first few series are launched, but to me, the blurred vision is no longer there and I understood the meaning and beauty of having this theme continuing. It is not about building bricks. It is all about innovation and uniqueness of what this one and only special theme can bring and will bring without any bias or licensed constrains. Generally, this is a great job done and I truly considered all 5 LEGO Collectable Minifigures Series truly great legacy. 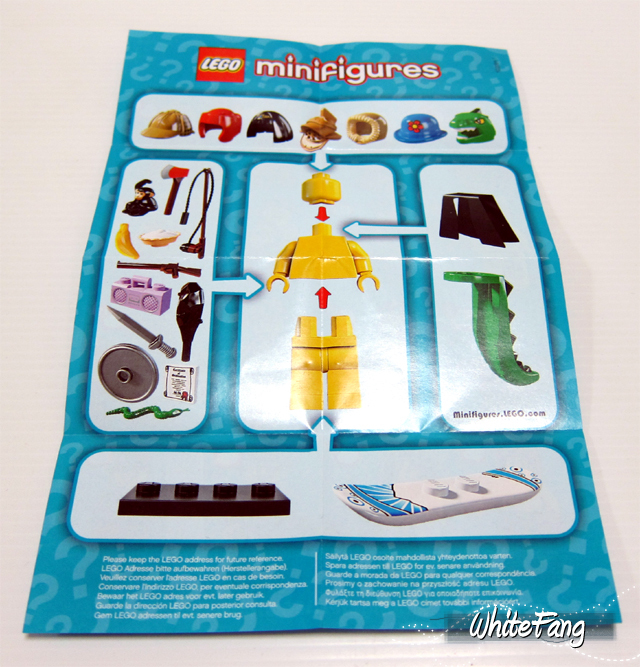 My only wish is to see the continuation towards LEGO Collectable Minifigures Series 6 and beyond. Disclaimer: 1 of the Aerobics Instructor is left out by mistake. Based on the above, I managed to achieve 3 full complete sets of 16 unique minifigs each. It means I have only 12 remaining random spares left. It also means we are back to the standards of Series 2 distribution level. No more 2 complete sets when we buy a full box. Read down to find out what are the remaining spares I have. Based on the data given, I have drafted my analysis accordingly. 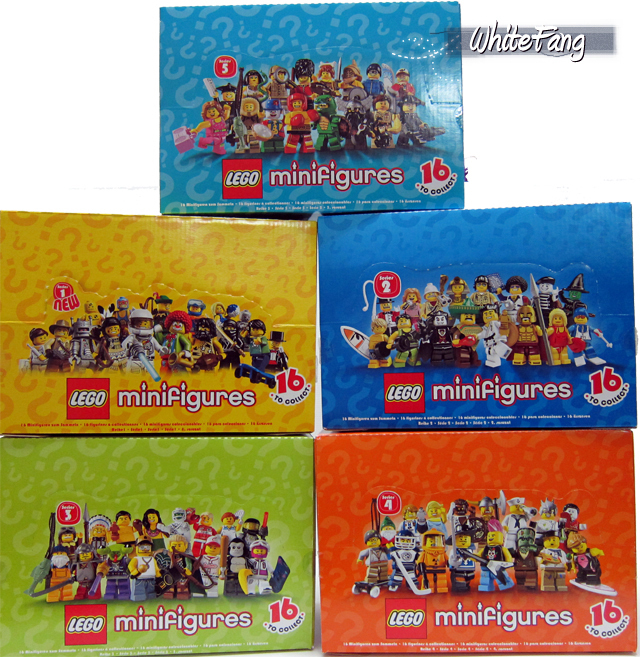 Buying 1 full complete MISB box will allow you to achieve 3 maximum complete unique set and we are finally back to the same distribution of the LEGO Collectable Minifigures Series 2 distribution level. I really hope this is not a mistake and I hope everyone of us will get the same distribution. 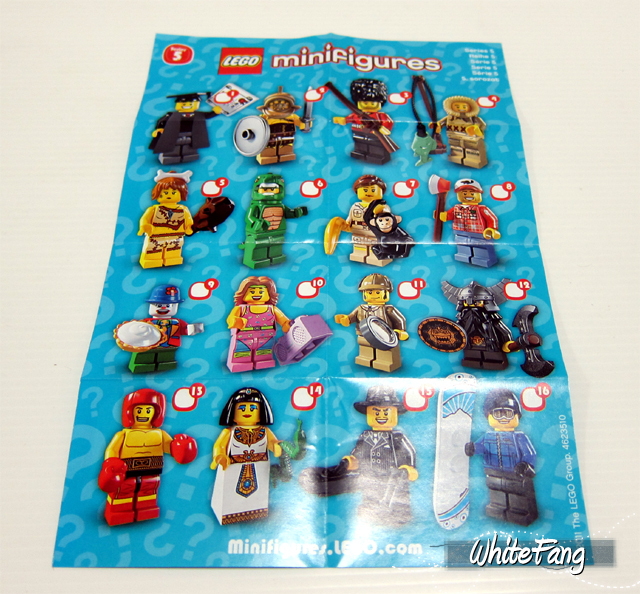 So far, each of the 16 unique minifigures have an equal chance of getting 3 out of 48 packets, when the box is opened and consumers will buy it separately. That will be 6.25% probability based only on 48 packets. 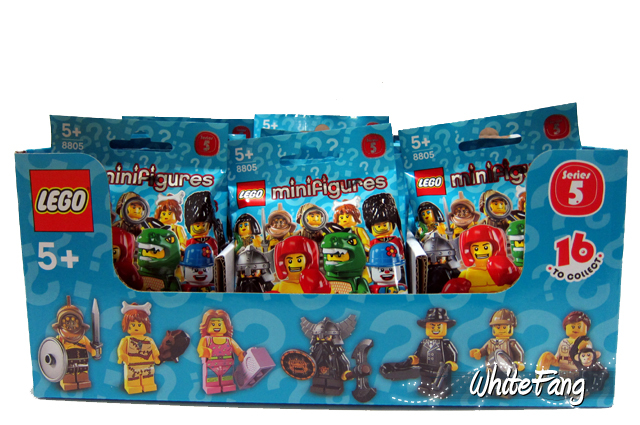 When you add the remaining 12 spares into the calculation, 7 unique minifigures are only available at 21 out of 60 packets and this translates to 35% in total and 3.5% each, which makes it even harder to achieve by just doing it randomly. Whereas, the probability of getting the Grenadier Guards, Zoo Keepers and Boxers are on the higher note, since they are available at 15 out of 60 and this translates to 25% in total and 8.33% each. However, the likelihood that this percentage will be lowered by at least half due to the introduction of the dotted system and fanatic LEGO hunters like ourselves who are scrambling to search for the ones that they are highly desired by many. Even so, I am still glad that TLG managed to bring back the 3 complete set distribution again as I am sure it will make fans who buy full boxes to be happier again. 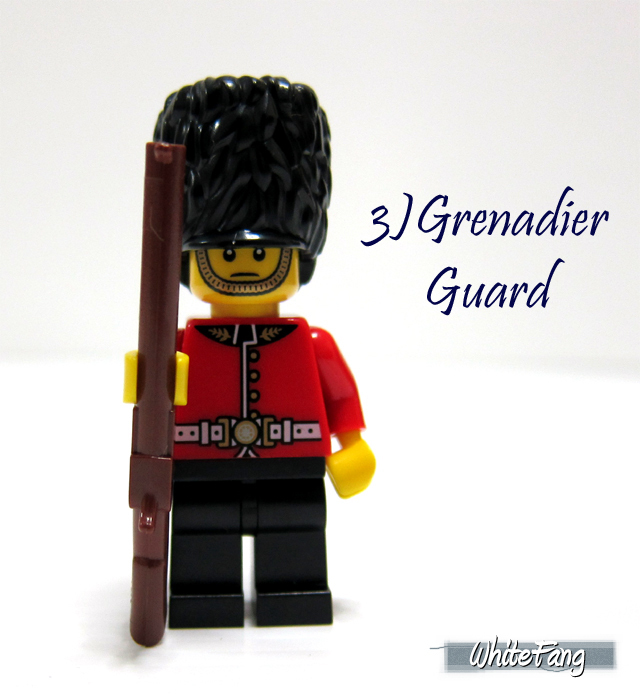 I am also happy to note that one of the popular minifigure which is the Grenadier Guard is available at 5 minifigures for each box. 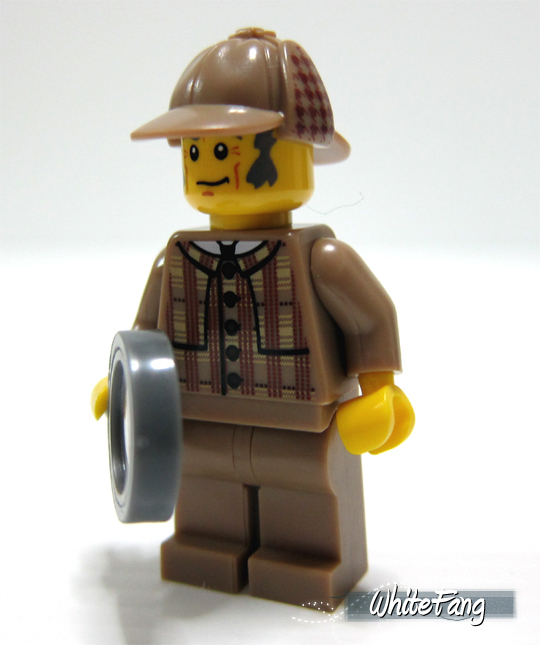 At least, it helps to ease the load of the searching this likely popular minifigure. 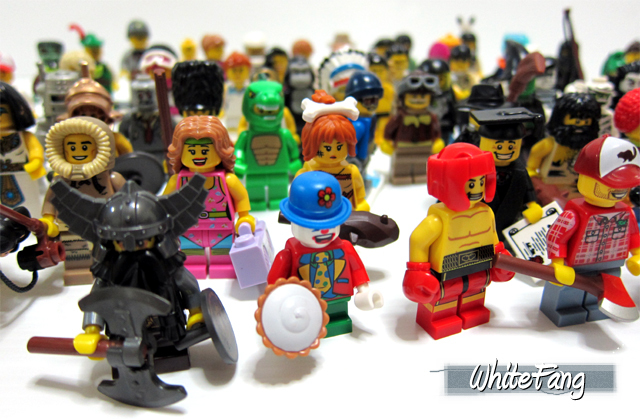 To conclude, the LEGO Collectable Minifigures Series 5 is remarkably amazing. I, was first disappointed with it when I first saw it but until I see those actual stuff with my very eyes, there is no doubt about it, that these minifigures have scored real high in my ratings. With plentiful of new and re-make designs being introduced and minimum usage of filler and plus the very fact that one box is able to provide at least 3 complete sets upon buying a full sealed box helps to increase the desire of collecting it. Overall, I am extremely satisfied with this current series too. 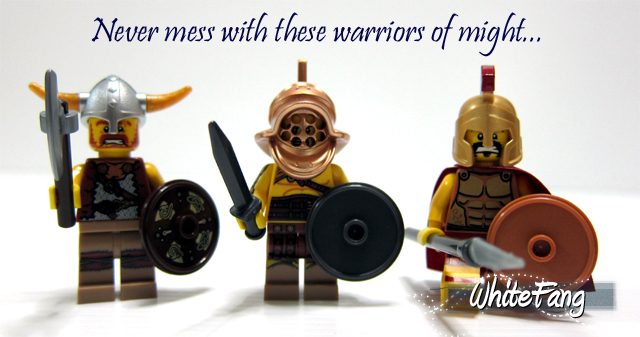 The Gladiator, Grenadier Guard, Cavewoman, Dwarf Warrior, Pharaoh Queen and Mafia Gangster are mine favourite Series 5 minifigures ever and it will be another hard challenging time for me and the rest to find them all. Do note that there are no longer contains the placement of spare parts from Series 3 and beyond. Will be updating these links soon. We have come to the end of this pictorial review. 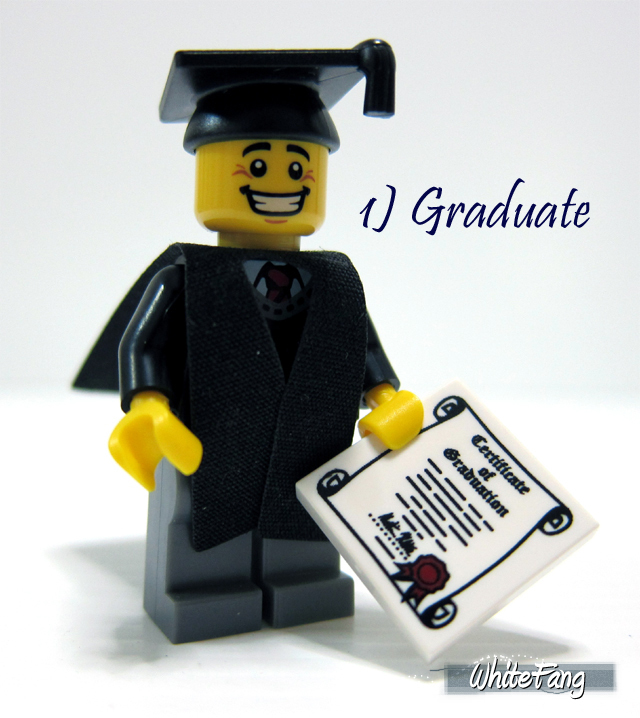 I believe it will be a no surprise for you especially if you have been active in Eurobricks for the past one year. 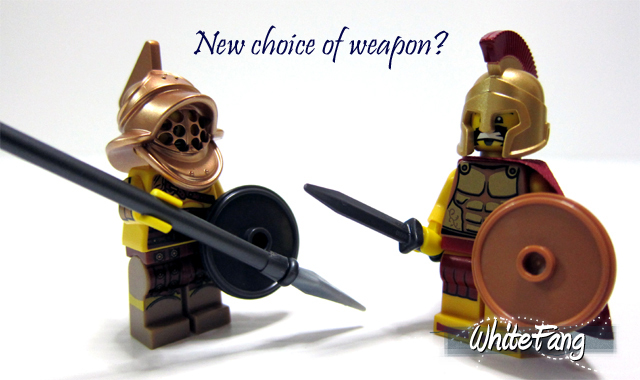 Watch out for more new upcoming excitement right here in Eurobricks LEGO Forum. 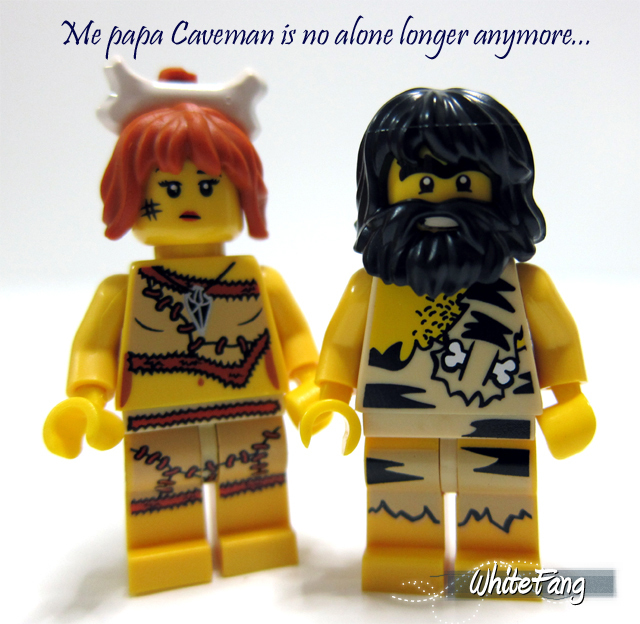 Excellent, excellent review WhiteFang - I truly love you ! Superb pictures, good writing and funny comparision shots with other older figs ! This series 5 is as good as the previev ones, if not even better. 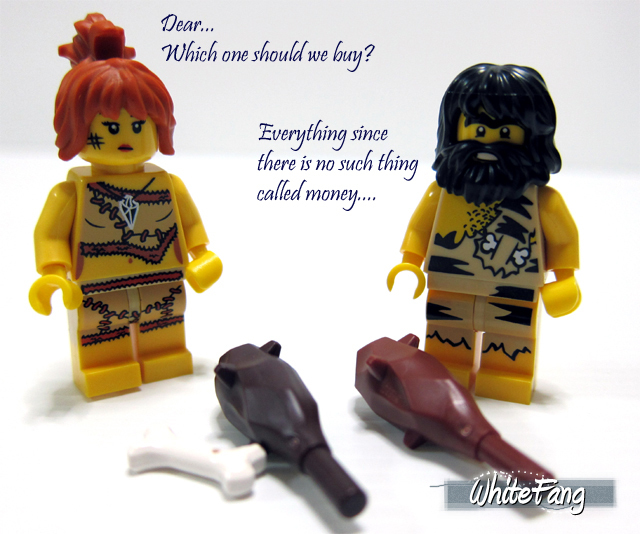 I think basicly all of them are great, and now that we start to get counter parts for example the caveman the total strength of the Minifig Series is showing more and more. I will buy a bunch of these that´s for shure! There are some really good minifigs in this series. 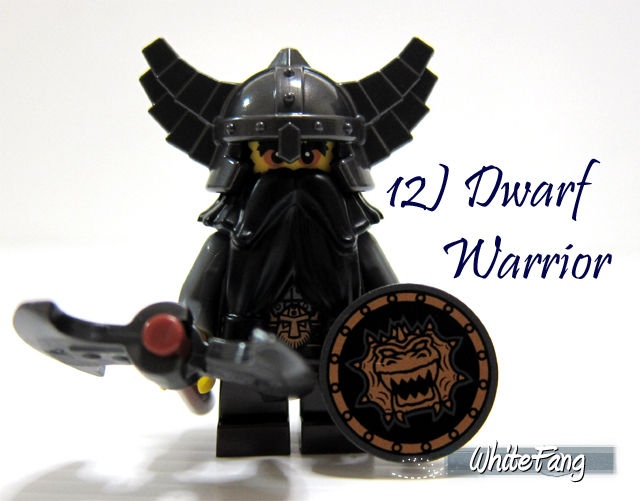 I know I will be most interested in the dwarf warrior. The torso and shield would even be good for human armies. Who will be the first to do a Monty Python scene with the lumberjack? That figure's detail is excellent. Too much to mention, you've covered it all anyway Fangy. Thanks for this comprehensive review, and the laughs along the way. Thanks for the review! I'm going to try to get the Grad, Woodcutter, Aerobics Instructor, Dwarf and Pharaoh Queen, I think. Of course, I'm going to have to go through Bricklink... no stores sell them in my area. Edit: What color are the Woodcutter's pants? Sand blue? 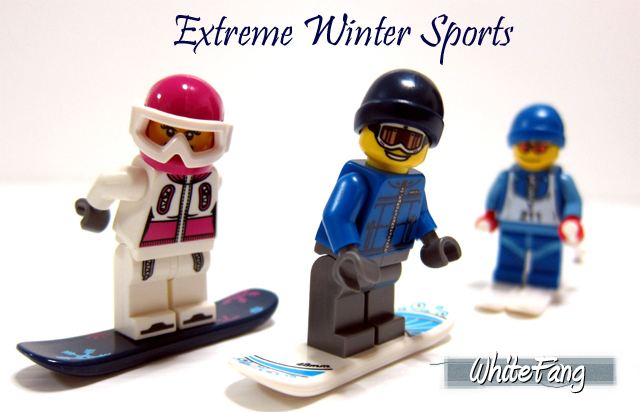 Thanks so much, Whitefang for yet another brilliant review! I've come to like this series a lot, even though I was very disappointed when I saw the first finalised images. 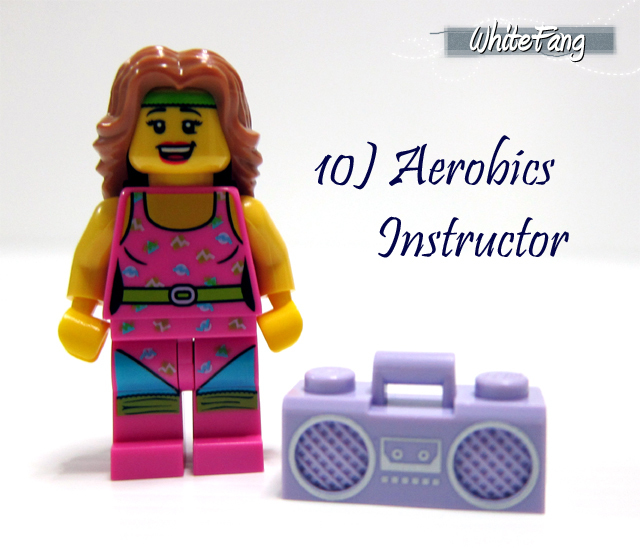 Now though, I like almost all the figures, even the aerobics instructor! 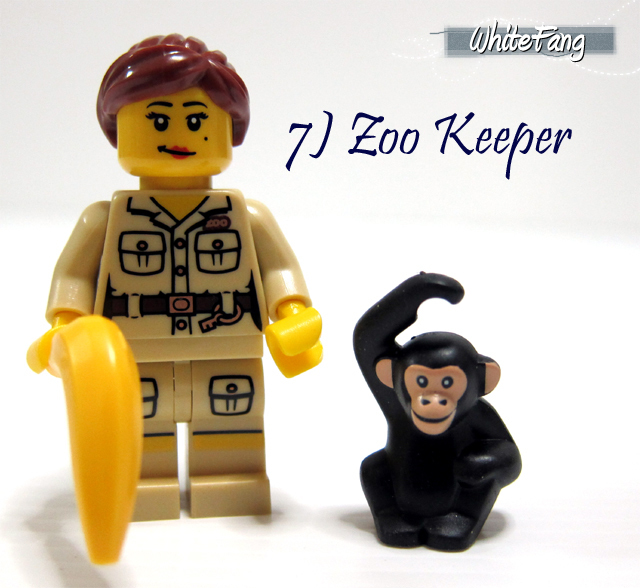 My favourite in this series is the Zookeeper. She's just such a great fig IMO, as she has the ponytail in a new colour, a great face and torso print, and the new monkey. The Cavewoman is a close second, with her lovely hairpiece and prints, and then the Egyptian Queen, because of the great hairpiece, dress slope and prints. I also particularly like the Clown because of his pie, the Aerobics Instructor for her pink parts and Godzilla for his green parts and his hat. I'm very happy with the numbers of each figure. There's at least 4 of all my favourites except the Queen. It's also good for the army builders, as they'll get at least three of each if they buy a box. I was wondering if the Egyptian Queen, the Zookeeper and the Aerobics Instructor had back prints? I think they should, seeing as they have the curves at the front. Great review, love the way you brought in the minifigs from the other series. I can't wait to get my hands on series 5. Stop stop stop... You had me at EVIL DWARVES!!!!!! 1. There's something very Wisconsin, no, Canadian about that lumberjack. And I mean that in a very good way. 2. Your review has just assured me that I must get at least three gangsters. That face will also come in handy with some pirates or something too. 3. Detective is perfect... we obviously knew he wasn't coming with a pipe, so after you concede that, I don't think he could look any better. 4. 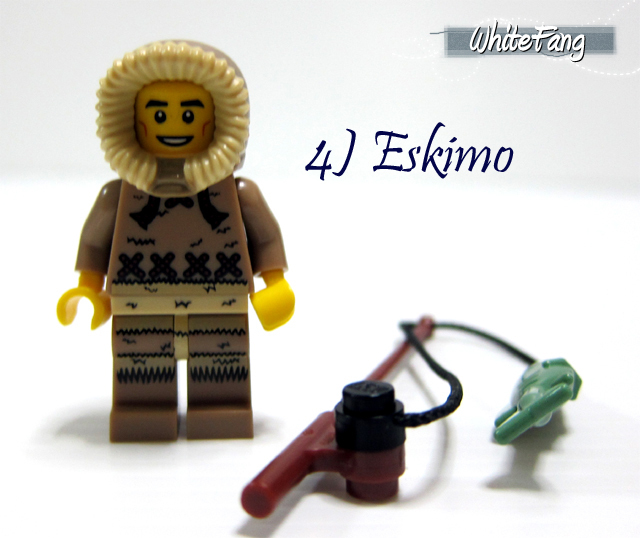 I love the Eskimo, but can't help but feel like the expression is just wrong for him. Wish he had more of a Native or Inuit look or something? This Series provbe rto be extremely useful for Batman. With all thgose mobsters, midget clowns, graduates. The series are also useful for my Castle figs with dwarves and Queens. my victorian figs and etc. I'm glad that the London guards, Sherlock Holmes, and Manny Pacquiao are not rare. 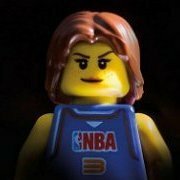 Is this the series with more female minifigs? I can admit when I'm wrong. I had initially said that they should stop making these after Series 5. In all honesty, there are some good ones being produced still (even some repeats, but at least they're different and not subtly altered). About Series Five, I give it about a 4, above average. 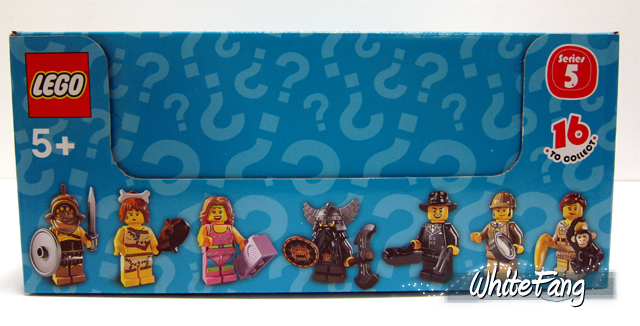 There's a few minifigures with the "wow factor" but there's also a few others that are just sort of repeated. As I said though, at least they're altered so they aren't exactly the same. (Although that exercise instructor is very similar to the S2 Pop Star). Over all, Series Two is still my favorite. Nice review, I envy that you're always able to get the boxes before everyone else. Fantastic review as always!!! Thank you they look great! 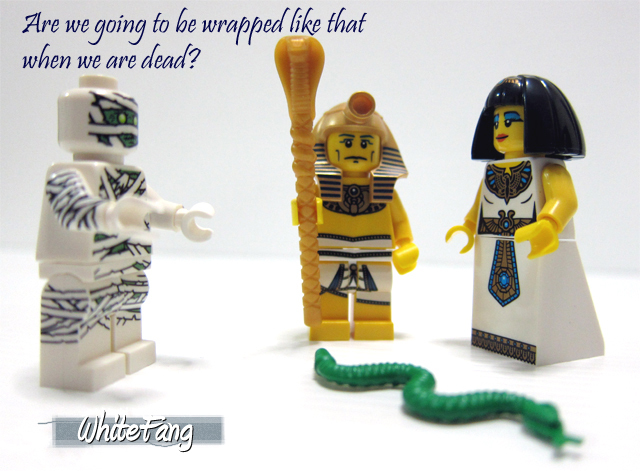 Good work as always Whitefang! I'm very happy that you always manage to review these as it spices up my day when I see the new one. While it's gotten to expensive for me to get eight, I'm still going to be getting a few of these figures. The cavewoman, the gladiator, the zookeeper, and the Godzilla suit guy. All of them are great figures though! As always, an excellent review WH, and I think this one is your best yet. Your picture quality is much better than some of your previous reviews. I really like how you grouped the minifigs based on theme - esp. 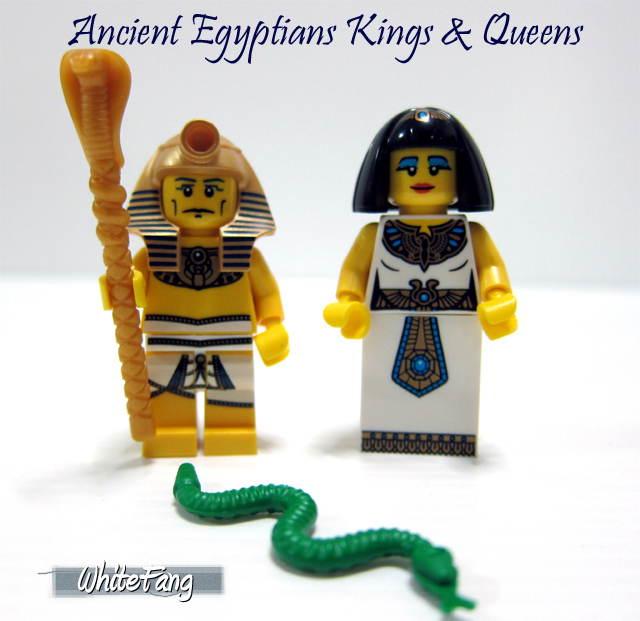 Circus, Evolution, and Ancient Egypt. The Godzilla Suit, English Guard, and Wood Chopper are among my personal favorites, but LEGO created a nice set once again. I'm looking forward to finding in my local TRU - another case to add to the collection. Again, great review! Thanks for sharing. Thanks for the excellent review WhiteFang . I'm still undecided about whether I like series 5 as a whole... For some reason, it doesn't give me the wow feeling. But when I look at the individual figs, I can't help but like them. I was thinking there were only a few of the figs in this series I really liked, but when I started listing them for myself, I found that I actually really like most of them... The only fig I think is a bit of a letdown is the aerobics instructor. 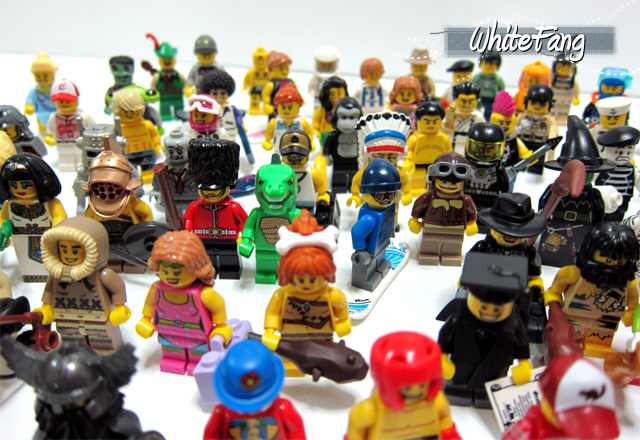 And besides, I am a bit manic compulsive about collecting all of these collectable minifigs . Gotta catch'em all! I'm just glad they made another series. Every series can be useful because they contain so many great special faces and accesoiries. 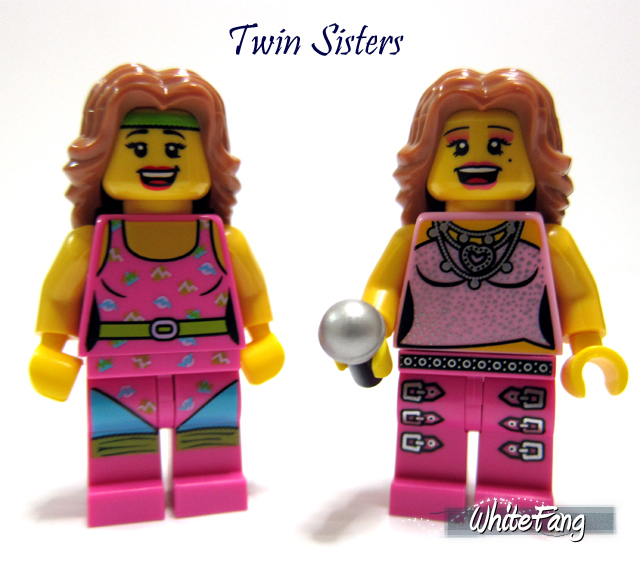 I don't know how many of these minifigs I will buy, but I will certainly order some of the most useful parts for me on Bricklink. They just keep getting better and better. Thanks for the fantastic review once again Whitefang! Im sure gonna try to ctach few of these when they hit on the stores. Depending ofcourse if i have enough money after this POTC line. 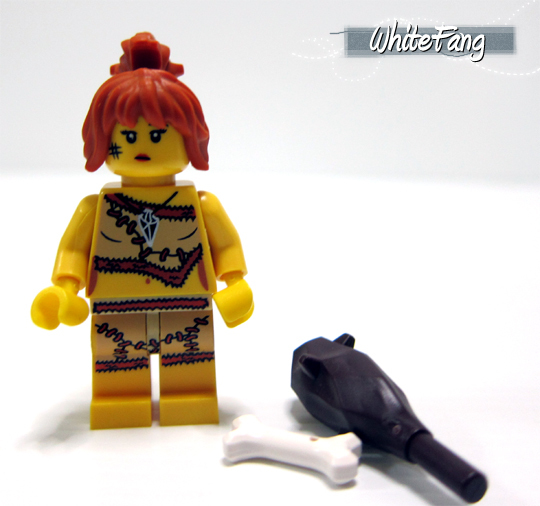 Yay WhiteFang for the early (and brilliant) review! I've been wishing and waiting for closer pics of some of the great printing and accessories in this series. I'm definitely getting them all, with multiples of the royal gaurds and dwarves a cert. I like the look of the violin case too- it'd be brilliant if the brickforge violin was able to fit in it, but i suspect i'm asking a bit much! This is a wonderful and excelent review. Thanks WhiteFang! I have a question considering the actual quality of the figs. As I heard on a documentary about Lego, the molds for molding machines are very expensive, about half a million dollars or something like that. These figs have a lot of new parts, so where's the catch? Are they poor quality made in China figs or what? Wow, I didn't exspect a review to be that soon. 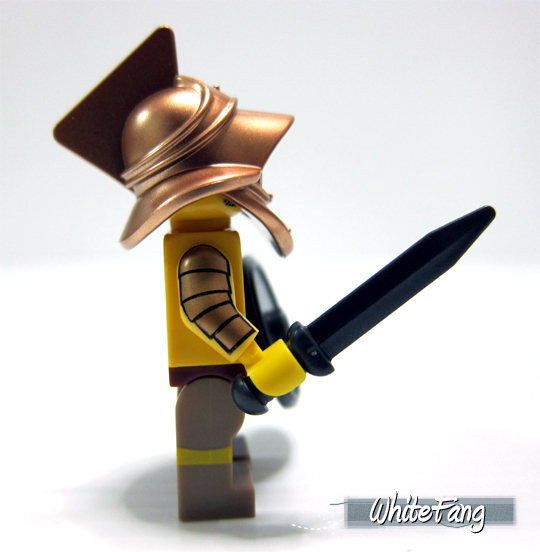 Thank you a lot, WhiteFang! The figs look really good, to me it's the best series so far (unfortunetly also the most expensive one ). 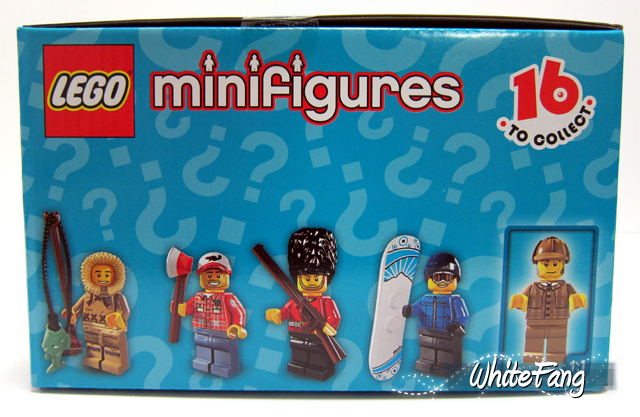 I like the details on some of the figs, such as the detective's hat-printing and the shirt of the lumberjack. And of course I hope I'll manage to get a few of the gladiators and some mafiosi. Overall, great and very detailed review! Whitefang, this is an outstanding review, that has me all excited again for CMF. Great review! I can't wait to get a few of these - as soon as I saw the lumberjack I knew I'd have to get it, and I might be one of the (very) few who's excited about the aerobics instructor as well. Actually, this might be the first series in which I want all of them - so many beautiful designs and useful parts! Also: is the lumberjack's hat red or dark red? It looks darker in comparison to the baseball player, though that may just be the lighting.